We pride ourselves on attaini ng one of the most prestigious certifications in residential roofing. 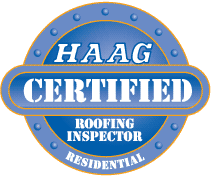 What sets HAAG Certified Roofers apart? We at Five Points Roofing have invested in the training and meticulous attention to detail that becoming a HAAG certified roofer requires. Our roofers were trained in a program that is designed to make us highly proficient with all major types of residential (steep-slope) roofs. We know precisely how hail and wind interact with roofing, proper inspection safety techniques, roof area calculations, and applicable codes. We also have a comprehensive understanding of manufacture, installation, weathering, hail damage, wind damage, maintenance, mechanical damage, and repair costs for each major roofing type — composition, wood shingle/shake, concrete and clay tile, asbestos, fiber cement, and various synthetic, slate, and metal roofing types. If you’re looking for a roofer, trust in Five Points roofing to get the job done right!